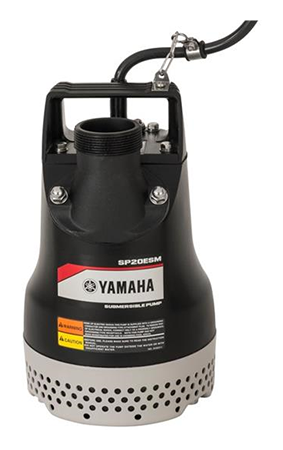 Two-inch electrically-powered, submersible pump can move 68 gallons per minute while only weighing 24 pounds. PUMPING POWER: Efficient ½ hp motor – Can pump up to 68 Gallons Per Minute or 4,760 Gallons Per Hour for quick and easy dewatering. DURABLE DESIGN: The SP20ESM Impeller and casing are manufactured from a blended rubber compound providing maximum wear resistance, up to three times over cast iron. LIGHTWEIGHT: Easy to transport - weighs only 24 pounds. WATER DISCHARGE CAPABILITY: 2 in. Port Side discharge and Side/Top discharge – Allows for dewatering surfaces up to 2 in. The SPESM model can be easily adjusted to discharge vertically or horizontally. PUMP SEAL PROTECTION: Double mechanical seals run in an “oil” filled chamber of liquid paraffin to prevent damage from periods of dry running. THERMAL PROTECTION: Built-in thermal protector turns off the power supply in case of overload, protecting the motor from overheating. LONG ELECTRICAL CORD: 20 ft. Power cord is uni-body construction ensuring excellent water tightness and long reach. LONGEVITY: Completely rebuildable - All parts are replaceable. Maximum discharge head - 33 ft.